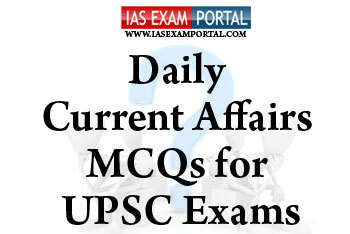 Current Affairs MCQ for UPSC Exams - 24 JANUARY 2019 | IAS EXAM PORTAL - India's Largest Community for UPSC Exam Aspirants. 1) Self attestation of certificates along with abolition of interviews at the junior level posts. 2) Passing of 124th amendment bill giving 10% reservation to economically weaker section of the general category, thus providing equal opportunity to all. 3) Amendments to prevention of corruption act bringing punishment to first time bribe givers along with provisions to provide adequate safeguards to the honest officers who are performing their task with integrity. 1) Around the world, 190 million people are unemployed, while 300 million workers live in extreme poverty, according to the ILO. Wage gaps are growing at a time of declining wage growth. 2) Two-thirds of jobs in the developing world are susceptible to automation, and only 15% of households in emerging countries have Internet access. 3) Implementing the Paris Climate Agenda and transition to a greener economy would lead to more loss of jobs than those created in the process. Q4. With respect to the newly created GST appellate tribunal (GSTAT).which of the following statements are true ? 1) It will become the first forum of dispute resolution between the centre and the state in matters relating to GST laws. 2) It can only hear appeals from state as well as central appellate authorities already created under the GST law. 3) The GSTAT has one president and 2 technical members with no representation from states which has led to objection from the states. Q5. The start of online inter-state trade through the e-NAM portal this month is a landmark achievement in e-NAM history and its strengthening in future will definitely add a new chapter to Agricultural marketing in the Indian context.The first inter-state trade on e-Nam portal took place between Andhra Pradesh and which of the following states in southern India ?